Elevate every foundation you’ll ever own to unprecedented performance with this state-of-the-art primer, which not only creates a flawless canvas and prolongs the staying power of make up, but also makes it waterproof! Oil-free, this airy, cloud-like primer actually repels water, so your make up masterpieces will be able to withstand tears, tantrums and thunderstorms. It glides onto skin effortlessly, concealing redness, minimising the appearance of pores, fine lines and wrinkles and providing broad spectrum SPF 15 protection. 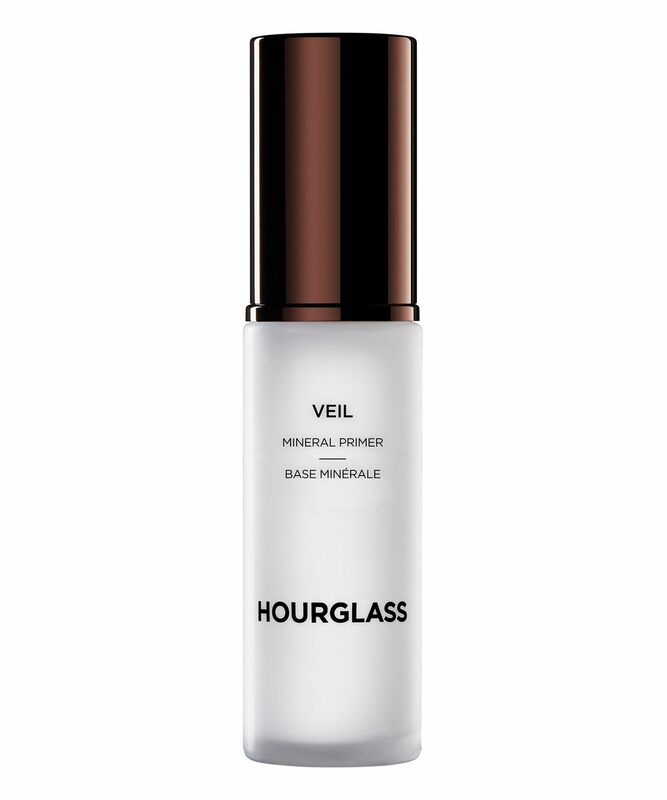 Sleek, chic and high-performing, this represents everything we love about Hourglass and it's available in Full Size (30ml), Travel Size (8ml) and Jumbo Size (60ml). The perfect complexion starts with Veil Mineral Primer. As the first step in your make up routine, it creates the ideal canvas for your makeup to effortlessly slide on and stay on for all-day wear. The silky, weightless texture smooths and evens out the skin for perfect application and wear every time. It’s the one product that will elevate your foundation to unprecedented performance. Bought this due to a few bloggers and YouTubers going on about how good it was. I did see a few bad reviews, but I did want to try it for myself. I wish I did listen to the bad reviews because I could have saved myself a bit of money, however I did only buy the travel sized one. It just did not work for me. It leaves a white film over my face and it did nothing for my black heads or pores. I thought it might have made them a bit better but it did not. Also, it does not create a good base for foundation. It’s so silky and smooth that foundation does not even stick to it. If you do not have oily skin or do not have black or white heads etc, then it might work for you. However, a friend of mine tried it and she has dry skin and it did not work for her either! Hopefully this will save someone making the same mistake I did. I do like that it came in a glass bottle though :-). El mejor primer que he probado hasta ahora. Deja un velo en la piel increíble. *** The best primer I've tasted so far. Leaves an incredible veil on the skin. Really dry, leaves a white cast, I got rid of it. Lucky I got the travel size and not the full size. Every other hourglass product I tried was amazing. I’d heard positive reviews in online beauty forums and YT vlogs, so decided to invest in the travel size and was not disappointed. This primer works well for oily skin. I was impressed at how well it worked in combination with the primer-translucent powder-foundation-translucent powder makeup hack. A little goes a long way and results were best when the product was patted onto skin, rather than rubbed in like lotion. I didn’t need to blot at all after 7-8 hours and although there was a little oil peeking through on the nose area at the end of the day, my makeup still looked good with a subtle natural glow, as opposed to an oil slick. I deducted a star because of the price of the primer, especially the regular size, which is very pricey compared to other high end primers of a similar quality and quantity. The primer also leaves a noticeable white cast on darker skin tones, however it disappears once foundation and setting powder is applied. I have tried various primers and never feel satisfied with them. This one is the one! It's perfect. The texture is initially surprising as looks like a fairly thick cream but it sinks in wonderfully giving a perfect base. You could wear on its own. However, once the liquid foundation is added the effect is perfect. Foundation stays in place and leaves no shine. Its the perfect primer. I bought the travel size but will buy the largest next time. This is the only primer you will ever need. Just fabulous. I'm not sure it does much for my pores but is pleasant to apply and leaves a perfectly smooth base for getting the best out of your foundation. This product is nice but it’s very pricey. It doesn’t prolong your makeup by a lot more. It does create a smooth canvas and it’s not heavy, but just that. Not a must have in my opinion. Mi experiancia con este producto ha sido increíble. A mi tipo de piel q es mixta le va genial, la hidrata y me aguanta bien los brillos con cualquier base, bueno menos con las bbcream y cccream. Saludos. ***My experience with this product has been incredible. For my mixed skin type, it's great. It moisturises and controls shine with a base on top, well at least with the BB and CC creams. Really good primer..keeps my pores area matte all day long. If you are looking for an all over primer you should definetly try the Farsali Unicorn Essence. I don't see anything effective about this very pricey product. It balls up on dry and moisturized skin both. I love this primer so much I haven’t used it for a few weeks as I have been trying a new one out and wanted to make sure I had the hourglass primer for some upcoming weddings, however with the hot weather my room is really warm, half a bottle of primer I had left has evaporated I’m so shocked for the price that this has happened, for £55 I only got to use half of it. I may just purchase the smaller bottles in future so I go though it quicker but I’ve only had it 6 months and it says 18 months on the bottle. Makeup sits really well over this primer and I was surprised at how good it smoothes the face for foundation application. The only downside that it's quite expensive but it's still worth it!